This is what happened to every app that was included in the daily collection or got the App of the Day card, which is why developers dream about it. We made an analysis of what those apps and games have in common and found some patterns that can help you to better understand what your game or app needs to increase its chances of being featured. Apple doesn’t pick up apps randomly. As with any commercial company, Apple is interested in revenue and in creating the image of iOS as a platform with high-quality apps and games. 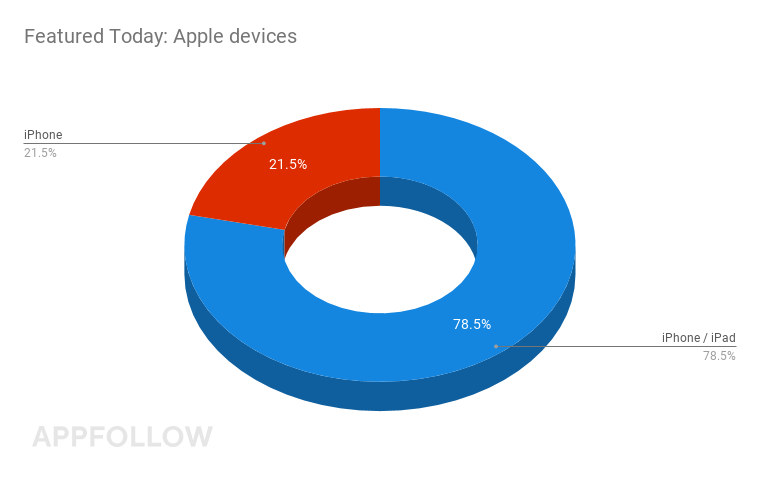 That is why paid apps, or apps with in-app purchases, are more likely to be featured, especially if those apps have high ratings and are available for other Apple products, such as the iPad or the Apple Watch. 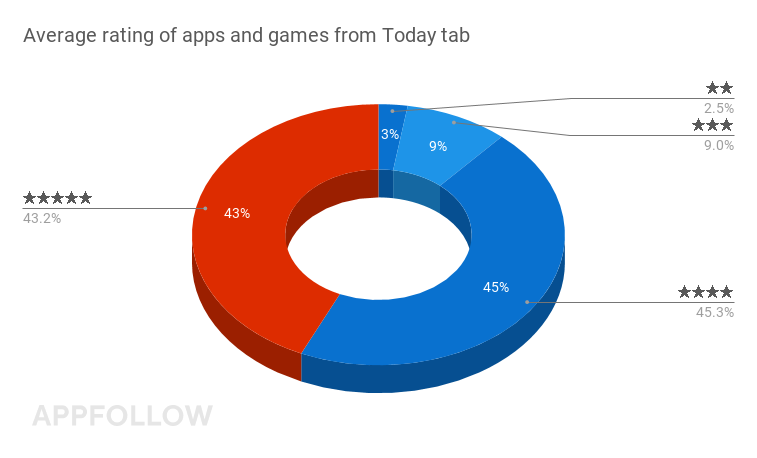 Two thirds of the apps and games chosen for the Today tab are either paid apps or ones with in-app purchases. Apps are more likely to be featured than games. 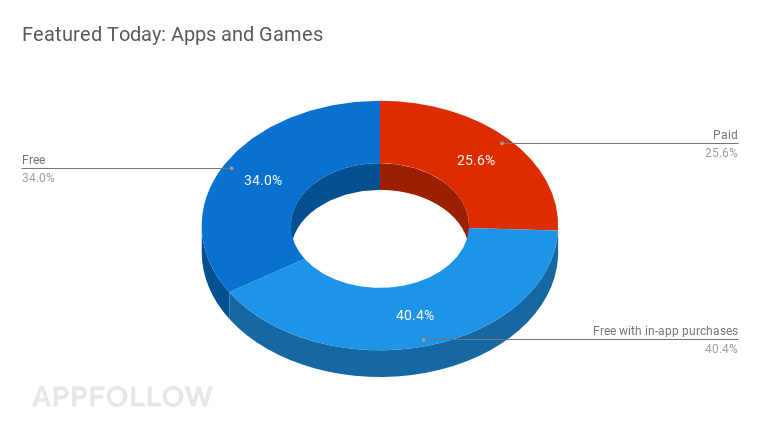 Over the past six months their share has been 70%, and, not surprisingly, the share of free apps is 46%, whereas for games, only 8% of all featured games were completely free. Two thirds of the games that have been featured on the App Store’s main page are free ones with in-app purchases. They push users towards buying bonuses, unlocking levels, and other things that will increase Apple’s revenue. Apps with a rating of lower than 4 stars are rarely considered by Apple for featuring. 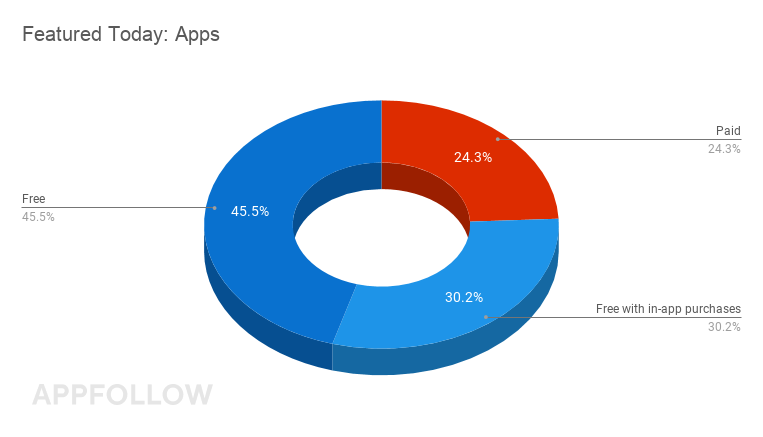 The average rating starts at 4.2 for featured apps, and at 4.4 for games. This is why working with the average rating should be the one of the fundamental parts of an ASO strategy for everyone who wants their app to appear on the main App Store tab. Another way to increase the chances of your app being featured is to make your app available not only for iPhone, but also for iPad, Apple Watch and other products featuring iOS, such as Apple Pay. This will require some extra efforts from the team, but the app availability for different Apple devices will be considered a big advantage by Apple’s editors. The Today tab is the same for both iPhone and iPad, which is why apps that are available for iPad are preferred by Apple, as in this way the users of both devices will see identical collections. If your app is available only for iPhone, there is a relatively small chance of you being featured on the Today tab. At the same time, your app can be mentioned in the Apps and Games tabs, as the apps are chosen separately for iPhone and iPad on these tabs. Being included in the app collections or on the App of the Day card is every developer’s dream. 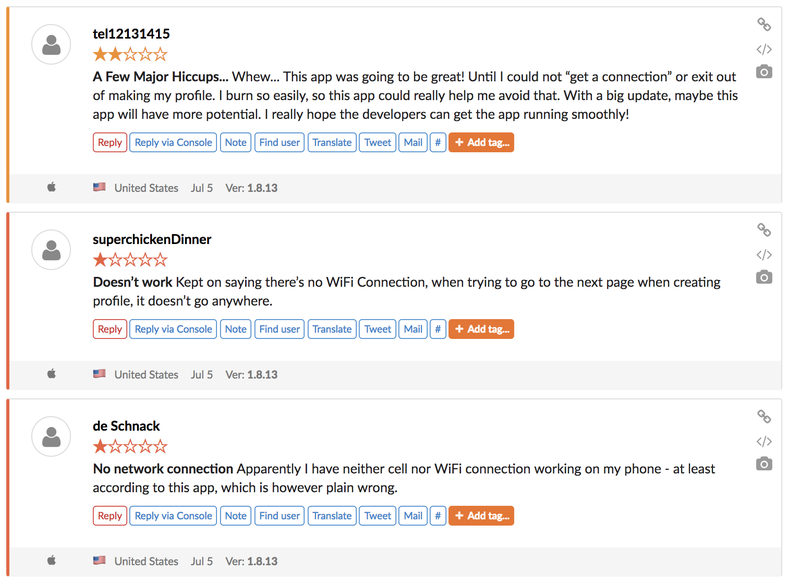 At the same time, though, getting featured can have a negative impact on the app’s average rating. For instance, if the game server is not ready for high loads and the game crashes, users will leave a negative feedback, and a high number of downloads will convert to a high number of 1* reviews. The outcome in this case can be really sad: a low average rating and a decreased number of organic users. Let’s take the QSun app as an example. It got the App of the Day card on the 4th of July in the USA, which set the app up for reaching TOP 50 Free overall. 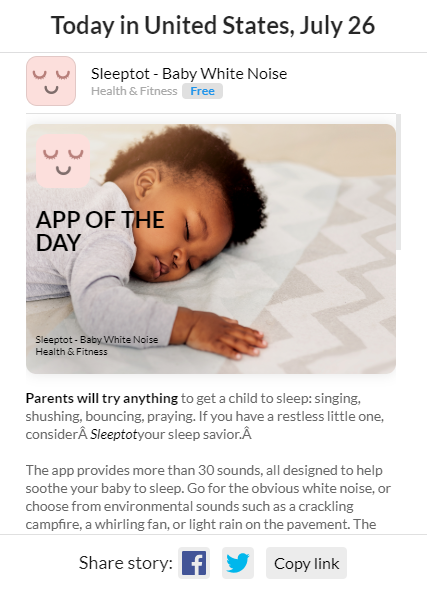 On the 23rd of June the QSun app appeared in the Today collection for the first time. Instantly its position jumped up from 1,300th to 50th in Free overall. The same thing happened when the app got the App of the Day card on the 4th of July. After that the app quickly lost its position back to 1,000. 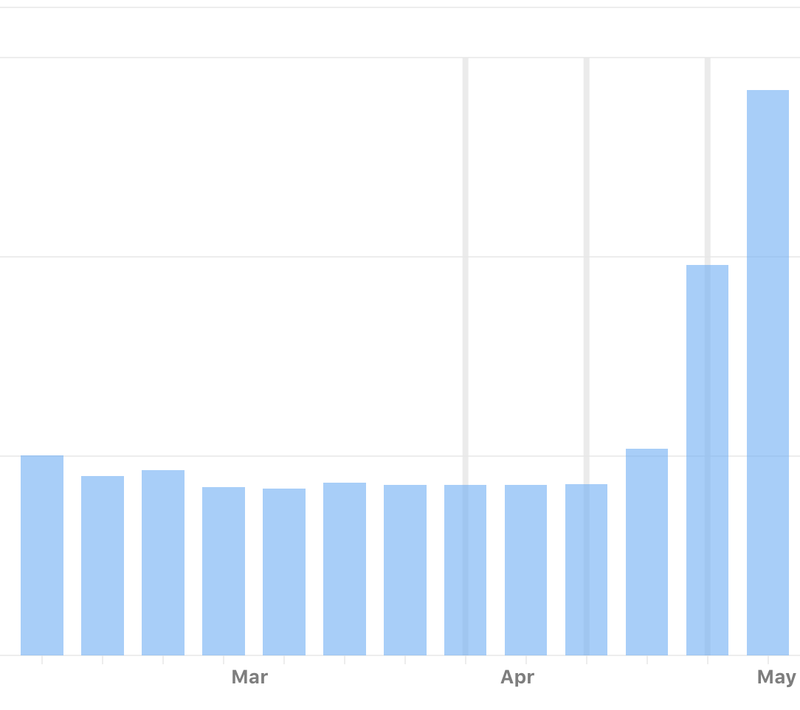 That happened because of server connection problems and the absence of basic ASO optimization: The app wasn’t able to keep its high positions in the charts. After QSun got featured for the second time, its position in the chart fell lower than 200 with only a 2* rating. We have already talked about this before — because of the low rating (3* and lower), the apps lose up to 70% of potential downloads. In order to smooth out a 1* review, you need to get no less than 10 5* reviews, which is not that easy. Despite the fact that Apple has the option of resetting ratings (not reviews, though) when the new version of the app is released, the App Store’s algorithms will lower the app’s rankings when it comes to showing it in relevant search results because of the low rating. If you look for features to help you increase mobile app installs, we recommend that you start with basic text and graphics optimization, and only then fill out the request form. If you are not so sure about your ASO, but want your featured app to work out the way it should, reach out to us. 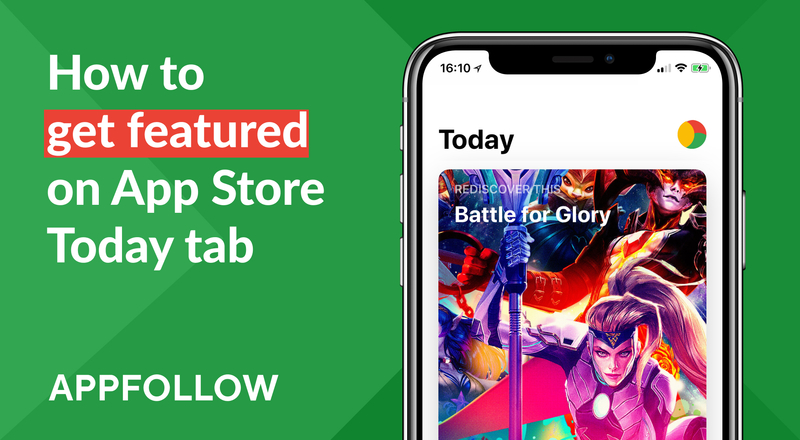 The AppFollow ASO team will help to prepare your app for getting featured and released, and increase conversion in terms of downloads, with a broader coverage of users. Getting featured always seems like something unreachable; yet at the same time, pretty much anyone can get it. All you need to do is to fill in the special Apple request form and have a bit of luck. You can give information about the app itself, and also announce a new release. Games — a collection of selected games. Which tab your app is going to be in is up to the Apple Review team to decide. You just need to fill out the request. We have gathered the links to the forms in this article. When filling out the form, pay attention to the Your Story section. You don’t need to talk about the functionality of your app here. Talk about how it can improve people’s daily life and their routines; for example, how people will be happier and much calmer if they use your yoga app, or how you have come up with a completely new game-play mechanics that is used in your game — talk more about things like that. If you are lucky enough, within two weeks you will get an email from Apple with the following subject: “App Store: Promotional artwork request for …”. This email will contain the requirements for the graphic materials. Usually you have a week to upload them in the Promotional Art section in App Store Connect. Pay attention to the Apple guidelines — as if you make mistakes, your app won’t be featured. If you have already made up your mind to fill in the request for featuring, double-check that everything works the way it should. Apple will consider your request for two weeks. Meanwhile, you can use this time to get you app ready to be featured. For instance, renew marketing materials (icon, screenshot, texts, preview videos) and perform load testing, so that a sudden increase in the number of users won’t affect the performance of the app. We believe that the best way to get ready for featuring is to find out about it in advance. AppFollow gives a unique opportunity for letting you know about your upcoming featuring the night before, at around 2:00 PM GMT — we will send you a Slack notification or show you the upcoming featuring on the Today page. The developer will then have the time to prepare the server and support team for the new wave of users. All the apps and games that you see on the main App Store page will be also mirrored on the Featured: Today page page and on the app page. You can track down information about any app and its Featured events since November 2017. The link with the date of featuring will open up the card on the Today page where this app was mentioned. In order not to miss your app being included in a collection, you should set up Slack notifications. We will let you know about the apps that are featured in different countries, and what positions the app has landed on in different collections. So gear up and be well prepared to meet featuring head-on. If you want to increase the chances of your app being featured, make sure it brings value to its users. Another copy of Flappy Bird with pixel graphics, even if it is available on Apple Watch and Homepod, probably won’t be that convincing for Apple in terms of its originality. The metrics of the app, such as performance rate, available version for tablets, and lack of abnormal app termination will also influence the editors’ decision. A good average rating (higher than 4.0) and positive reviews will also give you the edge over your competitors in the race to be placed on the main page.